Download and read yoour free financial management book. Here are a number of free books you can download on Financial Management. We like to provide you with good resources and material so that you can be better managers. Here are a of books for free, download any financial management book that would like. These are very good for the Finance Director and Finance Manager, as well as all non-finance managers who want to better their understanding on financial matters. Even in the Public Sector understanding finance is essentail. CIPFA – The professional finance body for the public sector, released research featuring that managers are more nervous today about their ability to provide services and maintain a sound knowledge of finacial advice within the public sector. These books have been provided free from BookBoon: Download any financial management book of your choice. Here’s 5 short tips to adhere to for financial success. 1. Read financial books: Tap into the knowledge of others. 2. Always pay yourself first: You’ll have to learn to relax. 3. Invest! It’s the only way to passive income and financial freedom. 4. Learn from rich people: Don’t repeat their mistakes. 5. Don’t put all your eggs in one basket: A form of insurance. If you follow these tips, you’ll start to see improvements in your financial levels soon. 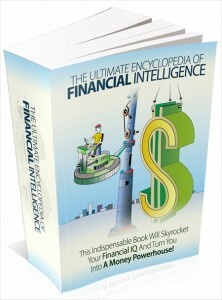 I also wanted to let you know about a new eBook called ‘Finacial Intelligence’. You’ll be equipped with everything you need to enter the world of investments! You’ll also literally start becoming a money magnet by adopting the right mindsets towards money. All for $9.99 – access to the book and others is available for $9.99 by signing up here at Reserved Position: Click here!